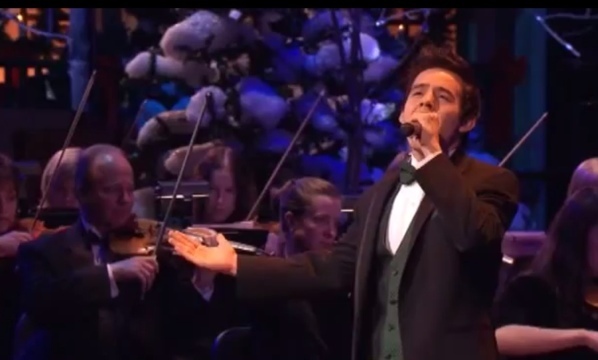 This video of David Archuleta performing Silent Night with the Mormon Tabernacle Choir and Orchestra has to be the most compelling, passionate and inspiring performance of this song classic I have ever had the pleasure to see and hear. Recorded live last Christmas and set to air on PBS on Tuesday, December 13th from 8:00-9:00 P.M., David’s arrangement of this beautiful carol is nothing short of exceptional. His phrasing, inflection, his lyrical, seamless vocal quality and expressive interpretation, are absolutely sublime. His face is radiant throughout this song and genuinely expresses the meaning of the lyrics in every verse. Watch how his demeanor changes for each verse. It is very evident in the third verse, where his facial expression and body language mirrors the text so very well. He wears his joy and happiness on his sleeve. It really is remarkable. David has released a CD and DVD with the Mormon Tabernacle Choir called Glad Christmas Tidings. It is an absolutely exquisite “watch and listen”, capturing the spirit of Christmas through stellar vocal and instrumental performances. It is available for hard copy or digital purchase from Amazon.com or via ITunes. But do yourself a favor right now and listen to the video below. It is an excellent way to begin your week and to be reminded where the meaning of Christmas truly lives and breathes. Also, I was just informed by one of my readers, Janey, that Silent Night is NOT included on the PBS special. So, if you want to enjoy the entire show, you better order yourself the DVD tout suite! Thank you Janey. I meant to add this link but was distracted here. Will add the update to the blog topic. Such a masterpiece rendition! David is a brilliant singer with such passion it can’t be put in words. He would have to sing it! Haha! MCL, Silent Night is a show stopper on his tour as well. I get to hear it live again, in all it’s glory, tomorrow night in my hometown!!! To say I’m excited is the understatement of the year, lol. I soooooooo agree with every word you said. I said to a friend the other day that when David sings Silent Night, it’s as if he is actually looking down and is actually singing it to THE Baby in the Manger. Thanks for the review Rosanne. I was lucky enough to be there and also have the CD/DVD. I’ve practically worn out one DVD. It also makes a wonderful gift ! Hearing your description makes it all the more beautiful. Thanks for your professional review!! Standing O for David and standing O for you too MCL. And there is something so magical about Angels From the Realms of Glory. Those Gloria Deos are absolutely heavenly. I also love Gesu Bambino “O come let us adore Him, adore Him Christ the Lord.” The whole concert is just…WOW! I agree with everything you wrote about Silent Night; this rendition is truly one of a kind. I was there! And it was magnificent! Thank you for this great write up! Thank you for the wonderful review, Rosanne. David’s performance of Silent Night is beyond exquisite. I don’t believe there is anyone in the music business that can sing Christmas songs better than David, or as well as David for that matter. That includes the great Josh Groban and Michael Buble. So that’s saying alot!! You can hear alot of heart and passion in his voice, that many other great singers kind of lack. This is one of the things that sets David apart. I agree Anita. Although, I think Josh Groban has a wonderful talent, and Michael Buble has brought back some of the sound from my youth, to me there is no one like David for delivering a song. He knows instinctively how to build a song, and I do believe that he has a story running in his head when he is singing. He is singing the story, not just the words to the story. He is the only singer that can bring out emotions in me that I didn’t know were there. It goes beyond goosebumps. I just love his phrasing, too. I love how you said David “sings the story”. What an awesome way to describe his singing! David is so very unique. There really is no one like him, and has one of the most unmistakeable voice in music today. I was there and this was a moment I’ll never forget! Brought me to tears (of course) and it was just beyond stunningly perfect! Thanks for the great write up! I’m bummed they are leaving it out of the special, though I knew they were gonna have to cut something. Your review is “spot-on”……Listening to David sings these songs gives me amazing joy and emotion that I don’t feel when other very talented singers do them. He has that third dimention to his singing when songs such purpose, as these do. I find myself tearing up at times, or getting a cold chill, or smiling during and after his performances. For example, no artist has come close to moving me the way David’s rendition of “Silent Night” does with such perfection and emotion. It’s truly inspirational and remarkable. I truly hope that David will have the fortune to work with really good people in the industry that will propel him in the direction of his career that is both fulfilling to him (and therefore, to us) as well as being profitable, so that he can continue the upward spiral of his chosen career. Wow David fans! Just wow! Do you know how wonderful it is to see and hear from the many, many fans that support David and his music? Quality rules the day when David is involved and many artists could- and should- take a page from his book and walk the walk in their pursuit for excellence. My new favorite Christmas song: David singing “Los Pastores a Belen” with the MoTab. It’s a fun sing-a-long in the car. Another fun moment is when you listen to some other renditions on youtube! It highlights the excellence David and the orchestra bring to the song, without losing the fun. Janey – yay and thank you!!!! I cant even put into words how I feel about David and his exceptional voice, It just puts me in a place of total peace. I absolutely love to listen to him sing, his voice is such a wonderful vocal instrument. He is simply amazing. This is absolutely beautiful–angelic–I’ve been playing it over and over at work. MCL, here’s a beauty in “Mary Did You Know”. Its absolutely beyond gorgeous. David sang it at the Anaheim VIP by request. Thanks for bringing that link over here. His delivery here is beyond belief. Not only does he believe every word he sings, but he helps us to believe too. What a gift. And the crowd was silent once he started singing – awesome. MCL, in case you haven’t heard…David made a special announcement in this video! I won’t reveal what it is…you’ll have to watch it yourself. Lets just say I think this will make you show even more love for him.